In our series of letters from African journalists, Zeinab considers Mohammed Salih why female protesters are angry with their male counterparts. 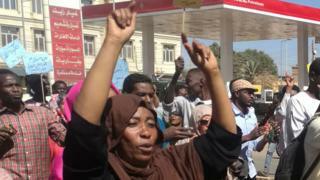 The anti-government protests in Sudan are unconscious despite an emergency imposed in February. This is largely due to the efforts of the Sudanese union (SPA), which has organized demonstrations against President Omar al-Bashir's nearly 30-year rule. 1; although some will argue, not women – although it is estimated that more than 70% of the protesters who have been on the streets since December are women. SPA was in hot water when it was suggested that instead of one day of scheduled protests on Saturday 9 March, people come out instead of cleaning the streets. The capital's streets, Khartoum, are extremely clever – and it felt like a good clearing would restore pride in the city. Since the protests began, the SPA has been particularly praised for the beautiful language used in its statements that require action. But in this case, it hit the wrong tone – especially encouraged women to face the task because they "used more to clean". The street tip was started as anger over the sexist attitudes of male protesters and has sponged into anger over how women are being treated in the Sudanese community. " The announcement was met with the indignation of many female protesters – and triggered a debate on social media about the sexism of the uprising. One day later, the SPA, which has a female spokesman, issued a regrettable apology. These protests began in response to an increase in bread prices – and then spammed into the most serious challenge for Mr Bashir's holding power since an Islamist-backed coup in 1989. Likewise, street cleaning faux pas anger over the sexist attitudes of male protesters and has mushroomed in anger over how women are treated in Sudanese societ y. On social media, comments like "just women protested" have been a particular point. Protesting women are not a New phenomenon in Sudan In 1946, 10 years before independence, the country's first female doctor, Khalida Zahir, took to the streets against British rule and was arrested and canceled. Another sore point is the recent use of the word "Kandaka" to describe a female protest. Kandaka was the word referring to queens in the ancient Kush kingdom who ruled Sudan thousands of years ago. The literal translation from Arabic of the controversial SPA statement read, "When is the cleaning day? On Saturday Kandaka – yes, we mean you because you are more interested in it." The reluctance of the concept is related to the fact that woman protesters do not look like others – they are people who take the same risks as everyone else. Women of all backgrounds and ages have protested – some on the front line, others standing in front of their houses protecting those fleeing live ammunition or tear gas. They also served protesters with food and drinks. Pictures have also been circulating on social media of prominent men who support the government and have criticized the demonstrations and mocking them by feminizing their faces on Photoshop. The implication is that they are cowards. This has led a group of feminists to launch a campaign called "Waqto wa naso" which means "time has come" and calls for such sexist attitudes to be condemned. According to the no-to-women repression group, between 40,000 and 50,000 women are arrested and tested each year by the police to lift the country's public order law imposed by Mr Bashir's government. The law regulates what women can wear – they can, for example, be emptied of wearing clothes as such as pants that are considered indecent or simply to be out with men who are not their relatives. This may include wearing an "indecent outfit" or "causing an irritation to public feelings". Interestingly, a court has referred flogging sentences to nine women accused of participating in protests. And the clean-up day in Khartoum took place – where both men and women participated. These might be seen as signs of changing times for women in Sudan.